Compelled to obey the dark god he pledged his soul to, Darien finds himself tasked with delivering the people of the Black Lands from under the curse of darkness which shrouds the skies. With the enemy mage Azár, Darien sets out across a barren darkscape to assume his place as the leader of a people who despise him. As he journeys deeper into the shadowed waste, Darien is confronted with difficult truths that force him to question every loyalty he has ever held. For there, in the brutal proving grounds of the north, Darien will be inexorably forged into the most dangerous adversary the Rhen has ever faced. My fabulous brother in law and fellow Virgo knows just how pull my strings. He gives me, oh say, book three in a series, then watches in full-on amusement as I drop everything, helpless against the impulse to run to the book store for books one and two. Being "she who must have the entire set" can seem like a nonsense compulsion, but getting more books isn't really a bad thing at all, right? So when M.L. Spencer offered ARCs of Darklands, I readied myself to burn through the first two. When she said I wouldn't have to read the first two in order to have a good grasp of the goings on in book three, I decided the only way to know for sure was to hold back my inner collector and start reading. 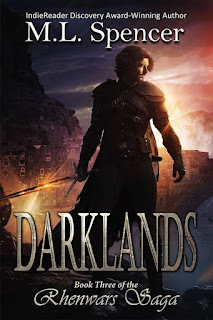 First, I was super happy to see Darklands was edited by the fantastic Morgan Smith, writer of solid, honest heroines and immersively tactile fantasy worlds. Though loaded with repercussions, heartache and grief from the previous two books in the series, Darklands opens with its own ominously laden action. The line between life and the afterlife quickly blurs and left me with the feeling of straddling both sides of the conflict filled streams winding through the book. I also loved the balance of voice between the various characters. To me, none stood out over the others and each clearly availed me of the differences in the way they see each other. Each change in point of view made a point of pushing the plot further or pivoting it around in a new direction while maintaining a great feel of being its own small story. I also felt a good sense of The Rhen and The Black Lands though I suspect much of the setting for book three is in areas not yet explored in books one and two. Though there are a good part of the lands I didn't get to by jumping in to book three, they have the solid feel of the place where your best friend, mage mentor, etc. grew up and gave them life through their first-hand telling. 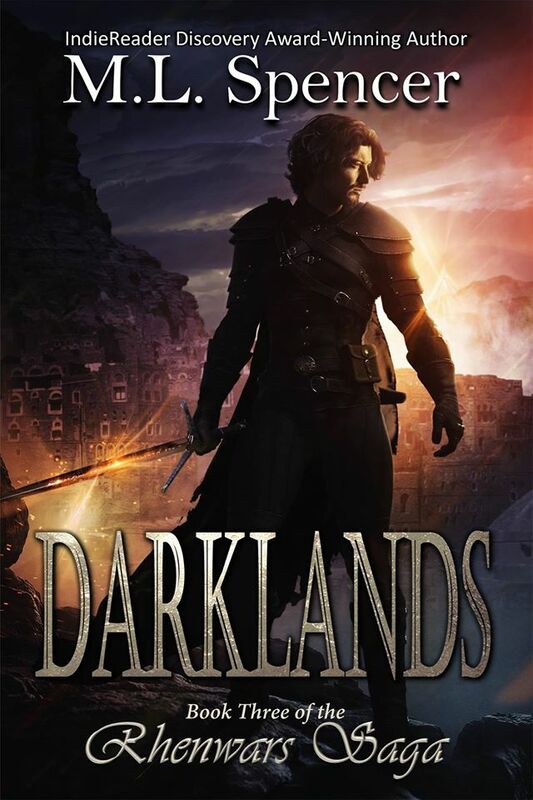 Darklands is a complete, dark, anything goes fantasy that brings together one of the ultimate challenges in fiction, the balance between life and death, and with it what happens when the very balance of light and dark is thrown awry. Find room for Darklands on your bookshelf and in your escape time. At night. Outside. So, if you'll excuse me, I'm off to Virgo my way through Darkstorm and Darkmage. I received an advanced review copy from the author in exchange for my honest opinion.